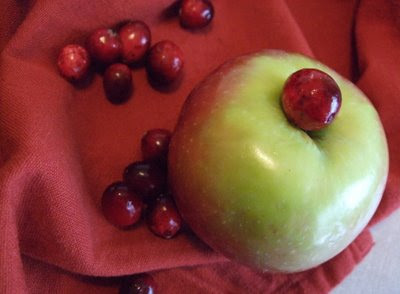 Apple-cranberry pie appears in a back copy of Cook’s Illustrated. 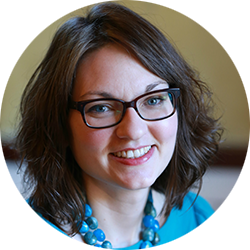 The genesis of this entry has roots all the way back to Thanksgiving. It was a small-scale feast for just me and MVH, and it was delicious. MVH grilled a turkey breast (a first for him), and it was smoky and moist. I made mashed sweet potatoes and breadsticks. For dessert was pumpkin pie. The most humble part of the meal, though, inspired the subject of this post. On the side also were applesauce (this leftover applesauce, actually) and canned cranberries. 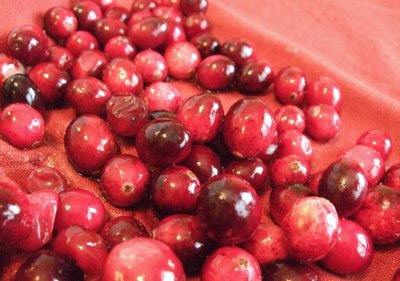 I know cranberry sauce is easy to make; I really like this recipe from Martha Stewart. But I had a hankering for the tart-buttery-starchy combo created by scooping a wee bit of cranberries onto a forkful of sweet potatoes. If I couldn’t spend Thanksgiving with my family, I would bring a slice of family tradition to my table with MVH. MVH delved into our library of Cook’s Illustrated magazines for guidance on grilling a turkey breast. 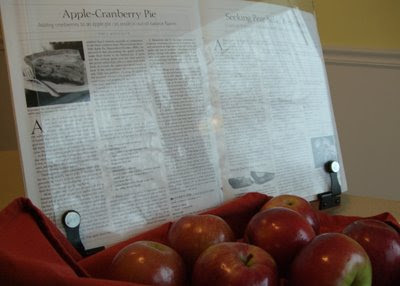 In an issue that gave advice on how to brine a breast (a not-to-be-skipped step in grilling, in my humble opinion), I spied a recipe for apple-cranberry pie. The pie became my contribution to my family’s Christmas Eve buffet. With this entry I wrap up my Eats of Eden apple series. We’re slightly out of apple season, but an apple pie around the holidays seemed like a crisp anecdote to the sugar coma brought on by too much fudge and frosting. Thanks for hanging around until the last apple was peeled. You’re the best. Have I told you that lately? Here is your final Eats of Eden recipe. The pie crust was a bit wonky. See how the excess dough hangs over toward the bottom of the photo? I don’t mind, though. I like rustic-looking pies. I used Macintosh apples, and while the taste was lovely, they were really mushy. A sweet, crisp apple is recommended, such as Golden Delicious, Jonagold, Fuji, or Braeburn. Bring cranberries, juice, 1/2 cup sugar, 1/4 teaspoon cinnamon, and 1/4 teaspoon salt to a boil in a medium sauce pan over medium-high heat. Stir occasionally, smushing berries against the side of the pot to break them. Cook for about 10 minutes until the juices are jamlike. Remove pan from heat and stir in water. Cool to room temperature. While the cranberries are cooking, mix 1/2 cup sugar, 1/4 teaspoon cinnamon, 1/4 teaspoon salt, and cornstarch in a large microwave-safe bowl. Add apples; toss to combine. Microwave on high for about 10 minutes, stirring every 3 minutes. The apples are finished when they just turn translucent around the edges and the liquid is thick and glossy. Cool to room temperature. While the fillings are cooling, consider making your pie crust. Or you could make it before you make the filling. The crust has to chill in the fridge for about 30 minutes before you roll it out. While the fillings cool, heat oven to 425 degrees Fahrenheit. This is a double-crust pie, meaning that it has a crust on top and on bottom. Roll out the bottom crust to about 1/4-inch thick. Transfer it to the pie pan and refrigerate until the dough it firm, about 30 minutes. When the dough is firmed, spread the cranberries into the dough-lined pie plate in an even layer. Top with the apple layer, mounding the apples slightly in the center. Roll the top crust, and place it atop the pie. Pinch together the top and bottom crusts. Fold under or cut off excess dough. If you’re feeling fancy, crimp the edges with your fingers, or use a fork to make a design and help seal the dough. Brush a lightly beaten egg white or water over the top of the pie; sprinkle with sugar. 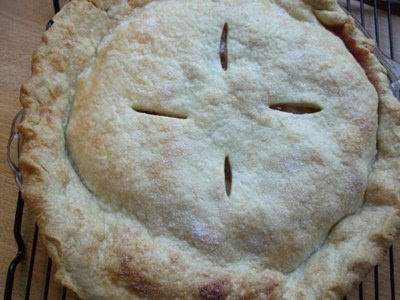 Cut four slits in a cross pattern into the top of the pie to allow steam to escape. Allow the pie to cool before serving. Bagged, fresh cranberries now are in season at my grocery store. Watch for them in the produce section. The berries freeze great, if you’d like to have some on hand in the future.